The RaggTopp Premium Convertible Top Brush is one of the few brushes designed specifically to work with RaggTopp Convertible Top Cleaners and the only brush to be endorsed by the Haartz Corporation. 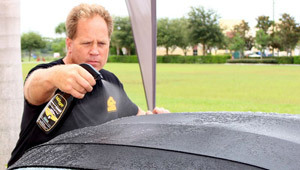 Manufactured using NYLEX® bristles that are soft enough to cause no damage, but strong enough to fully clean your convertible top, and set into an ergonomically correct wooden handle, the RaggTopp Premium Convertible Top Brush is, without a doubt, the best brush for your fabric or vinyl convertible top. 2 inch featherd bristles help to dig deep into the convertible top for a thorough cleaning. When cleaning something as delicate as a convertible top, you want to right tools for the job. Use a brush that’s too stiff and you’re REALLY going to notice it. Use a brush that’s too soft, and you’ll be scrubbing for hours. 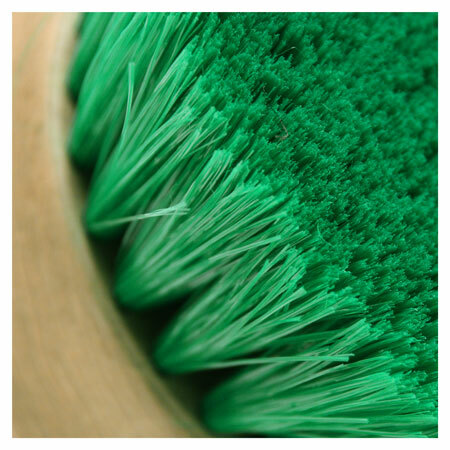 What you need is a brush with the right bristles, attached to the right handle, and of course, the right cleaner. The RaggTopp Convertible Top Brush, especially when paired with RaggTopp Fabric & Vinyl Convertible Top Cleaner, is that brush. RaggTopp Premium Convertible Top Brush features 2 inch long bristles manufactured using NYLEX® material, as well as a feathered split end, for a gentle yet effective clean. The round, dense wooden handle measures about 4 inches for the perfect fit in the palm of your hand. Your grip won’t slip with the RaggTopp Premium Convertible Top Brush! After spraying your fabric or vinyl convertible top with RaggTopp Convertible Top Cleaner, use the RaggTopp Premium Convertible Top Brush to gently scrub at stained areas. If you notice more stubborn areas, allow the RaggTopp Convertible Top Cleaner to soak before using your brush to scrub them away. Start by spraying your convertible top with RaggTopp Fabric/Vinyl Cleaner. Be sure you get an even coverage. Starting at the lowest point, use the RaggTopp Premium Convertible Top Brush to gently clean the top. The RaggTopp Premium Convertible Top Brush has feathered ends that help to create a nice thick lather, perfect for scrubbing and a deep clean. After a thorough cleaning, simply rinse away and allow to dry. Once dry, you can protect your top using RaggTop Convertible Top Protectant. Once you’ve finished with your wash, simply rinse the RaggTopp Premium Convertible Top Brush with water and allow to air dry – it will be ready for the next detail when you are!